Is it just me? Or does every Costco shopper end up buying those huge tubs of cashews because they’re just way too tempting? Even among my own family members, I can count quite a few who have a weakness for those lovely, whole crescent-shaped nuts crammed generously into those big plastic containers. Indeed, when I visit, I can’t help but notice the tub sitting on a coffee table or kitchen table, ready to be opened at the slightest hunger pang. I’m definitely guilty of that. But I also wanted to do more with my hoard of cashews than just shovel them into my mouth. Leave it to Martha Stewart to come to the rescue. 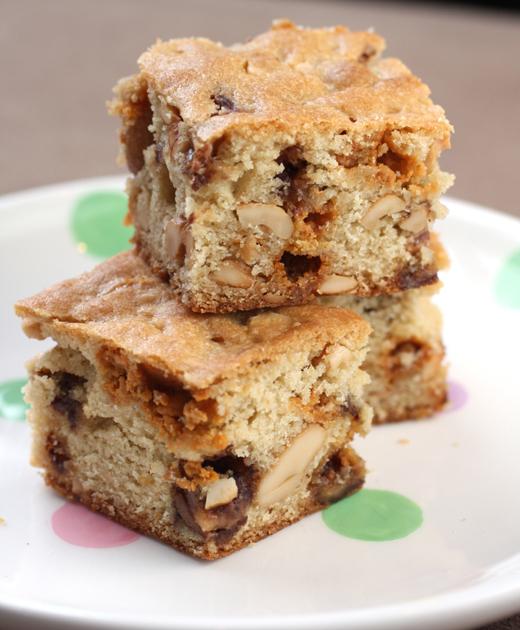 Her “Butterscotch-Cashew Blondies” are tender with a touch of crunch and a wonderful caramel-toffee-vanilla flavor. The recipe is from her cookbook, “Martha Stewart’s Cookies” (Clarkson Potter), of which I received a review copy and haven’t been able to stop baking from ever since. 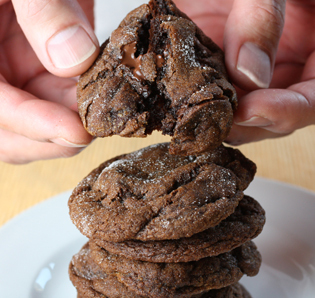 These bar cookies are as easy as it gets. They’re loaded with butterscotch chips, toffee bits and, of course, plenty of chopped cashews. The recipe calls for unsalted nuts. 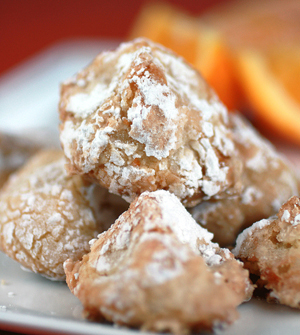 But you can easily use the salted kind if you like your baked goods to have more of a saltier edge. Just decrease slightly the 3/4 teaspoon of salt called for in the dough. Enjoy these blondies, and the fact that you’ll still have plenty of cashews left in that big ol’ tub to eat out of hand when the craving hits. Preheat oven to 350 degrees. Butter an 8-inch square baking pan and line with parchment, allowing a 2-inch overhang. (Alternatively, you can use aluminum foil instead.) Butter lining (not overhang). Put butter and brown sugar in the bowl of an electric mixer fitted with the paddle attachment; mix on medium speed until pale and fluffy, about 3 minutes. Add eggs and vanilla; mix until combined. Reduce speed to low. Add flour mixture, and mix, scraping down sides of bowl, until well combined. Mix in butterscotch chips, cashews, and toffee. Pour batter into prepared pan; spread evenly with a rubber spatula. Bake until golden brown and a cake tester inserted into blondies (avoid center and edges) comes out with a few crumbs but is not wet, 42 to 45 minutes. Let cool slightly in pan, about 15 minutes. Lift out; let cool completely on a wire rack before cutting into squares. 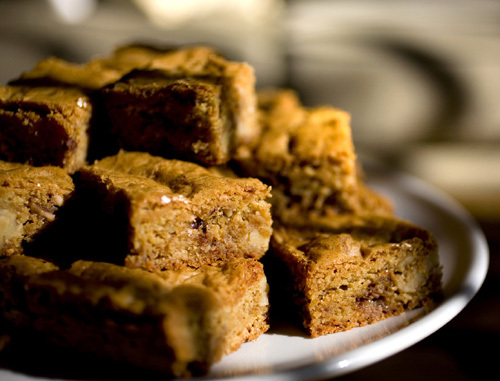 Blondies can be stored in an airtight container at room temperature up to 3 days.